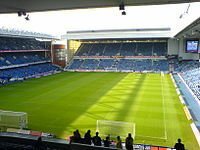 The 2004–05 Scottish Premier League was won by Rangers. Rangers won the title on the final day of the season by a single point from Celtic, who had gone into the final fixtures leading, but conceded two goals in the final two minutes of their final game to Motherwell striker Scott McDonald, costing them the title. As league champions, Rangers qualified for the UEFA Champions League, with runners-up Celtic also qualifying. Third-placed Hibernian qualified for the UEFA Cup, as did Dundee United, who took the Scottish Cup place despite losing the final to Celtic. Dundee were relegated, and Scottish First Division winners Falkirk were promoted. John Hartson was the top scorer with 25 goals for Celtic, whose manager Martin O'Neill stepped down at the end of the season after five years and a host of major trophies. ^ As Celtic, the 2004–05 Scottish Cup winners, qualified for the UEFA Champions League via their league position, the place in the UEFA Cup was passed onto Dundee United, the cup runners-up. 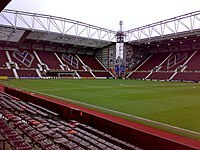 ^ "Heart of Midlothian Football Club". Scottish Professional Football League. Archived from the original on 2013-10-22. Retrieved 11 November 2013. ^ Inverness played their first fourteen home fixtures at Pittodrie Stadium, while the Caledonian Stadium was expanded.